Yeah but how will they explain why the logo on the back isn't holding up the II/peace sign? [nerd hat] Clearly this is the Ecto-1, not the Ecto-1A. Just kidding about movie ruined. But I always assumed the 1A was just an upgrade of the 1, not a separate vehicle. The lack of evidence suggesting otherwise in GB2 plus the application of Occam's razor would certainly support my assumption. I'm with you. They got some 'splainin' to to! 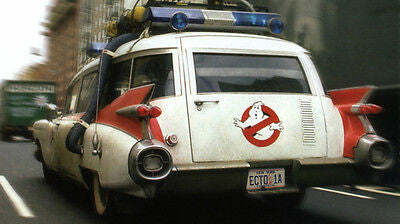 and... if they had another wagon... why wouldn't they call it "Ecto-2"??? Now I cant even enjoy GB-2! All I can think about is that they needlessly got a new license plate! OMG.. what a mess... that should be Ecto-3!!! LMAO, it really should be called "The Apology." I mean, what did they think was going to happen when they rammed a movie the vast majority of the fanbase didn't want down their throats instead of doing this from the get–go? At least the studio finally learned what fans wanted, I just wish they'd done this from the get go instead of trying to jam a reboot down everyone's throats despite nearly unanimous protests. (And really, that's where people had an issue with "Ms. Ghostbusters;" the all female cast was just a distraction that was easy for online trolls to attack while detracting from the larger problem of a reboot that nobody wanted.) I'm glad we're finally getting a proper sequel though. Say, any chance we can get some gratuitious Nintendo product integration while we're at it too? I mean, that was a high point of taking on Stay Puft.